Lia Ices' third album is nothing short of folk style innovation. Folk music doesn't really lend itself to innovation. When tried and tested folk musicians do try to spice up the relatively narrow sound of folk it can result in some disastrous consequences. When Lia Ices entered the rarely tread realm of cool indie folk music back in 2008 with her debut album Necima, there was definitely a sense of "one-album-is-all-you-need" from her. And while her follow up Grown Unkown had its one or two pleasure points, her musical style and relatively lack of variation led you to believe that every subsequent album she would release would be pretty much the same retread of terrain already traveled. Boy, did she ever prove me wrong! 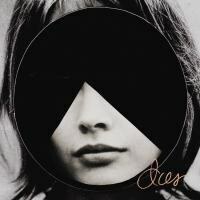 Ices, Lia's follow-up to 2011's Grown Unknown release is nothing short of a massive accomplishment in experimental folk music that pays off in the most surprising ways. From the opening "Tell Me" with its Eastern inspired instrumentation and carefully executed production that makes everything sound like it all just fell into place by accident, you get the sense that you're in for a sonic ride that has rarely ever been achieved with the typical folk album. Lia, and producer Benny Sagittarius, have opted for a more dreamy and warbly approach this time around, and while this style muddles the Lia's hypnotic reverberating vocal style, so that you can barely make out what she's singing, the sheer sense of what the music evokes makes this shortcoming easy to forgive. "Thousand Eyes" the second single and second track on the record, continues the swinging Eastern vibe that was set by "Tell Me" but it's "Higher", the third track, that manages to convince the listener that Ices is Lia's best album to date. With instruments that sound like they were purposefully filtered through an old '70s vinyl LP on its last few spins, she sings: "I got wings and baby I am made for flying / I seen apparitions as I keep on getting higher / You gotta keep me close, you gotta let me go / The farther up the farther up that I can go now / The nearer into to you I promise I will fall down / I will never leave you lonely." It's a vacillating love song of connection and withdrawal sung to a happy (well, as happy as a torch singer can get) swinging beat with chimes flowing in and out. It's combination of beautifully sung melodies that evoke heartache over a sing-song beat suggest "Higher" is trying to establish a whole new genre all its own. It's the highlight on the record, but that's not to say the rest isn't filled with continuous surprises. While the tracks that combine fluttering synths overlaid on top of Eastern inspired chimes and string instruments and played against a stop-and-go rhythm section (that is equally filled with interesting patterns) are the most striking on Ices, Lia tempers these more upbeat moments with beautiful circuitous tracks that are musically less involved, such as "Love Ices Over", "Sweet as Ice" and the engaging album closer "Waves". The album is carefully paced so as to keep the listener engaged throughout, careful not to overburden with inaccessible sounds, or bore with meandering melodies that overstay their welcome. Lia Ices has managed to cross the terrain of pigeon-holing folk music and deliver something that few artists in that genre manage to accomplish—a newly inspired collection of tracks that transcends the narrow confines of that musical style while maintaining a consistent homegrown sound. And while the album may be hard to follow lyrically at times, Lia's entrancing and absorbing vocal style help keep you firmly placed in her grasp managing to convey a message through sound rather than words. Moreover, at ten tracks, Ices never overstays its welcome. It's an album that's impressing and promising of a creative and innovative career from this young artist.